Whilst going through my back copies of GFM I came across a recipe for custard creams. I eat far too many of the shop-brought versions in the staffroom after they have been dunked in my tea. They almost beat Jammy Dodgers to my favourite biscuit! The original recipe uses a food processor, but as I have no room for a hallowed Magimix I had to do it the old fashioned way. I was a bit too generous with the biscuit size and used a 5cm diameter cutter leaving me with only 8 complete biscuits. Next time I’ll use a smaller cutter. I also did a pretty pattern on the biscuits, but this almost disappeared after baking. 1) Preaheat oven to 180oc (160oc fan). For the biscuits mix flour, custard powder and baking powder. Add butter and trex and rub until you get a crumble like texture. Beat milk into egg in separate cup. Add sugar then gradually beat in egg/milk mix (you may not need all the egg) until you have a soft dough. Wrap dough in clingfilm and rest in fridge for 20 min. 2) Roll dough to around 4mm and use cutter to cut out shapes. Place on lined baking tray and bake for 15 min. Cool on rack before sandwiching them. 3) To make custard cream, mix icing sugar and custard cream then beat in butter until you have a cream. Add water and beat again. 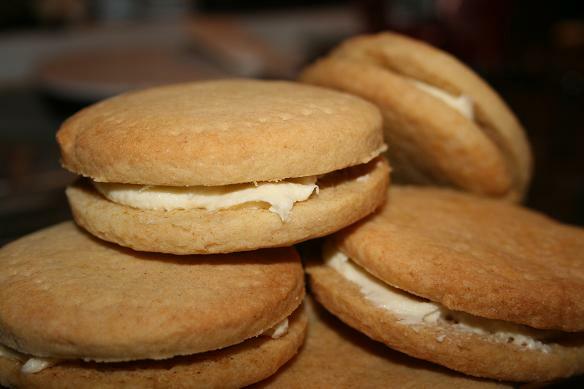 4) Sandwich each biscuit with about 1 tsp of custard cream. My plan is adapt the recipe to make coffee creams. I can remember them from when I was younger, but there is no sign of them in the shops now.